One of my favorite things about summer in Breckenridge, CO is being able to ride a bike everywhere. Main Street has bike lanes on each side, but there is also an alley behind the shops, great for those of us with younger kids who don’t understand traffic or staying on the side. You can even ride on wide bike trails to the nearby towns of Frisco and Dillion. 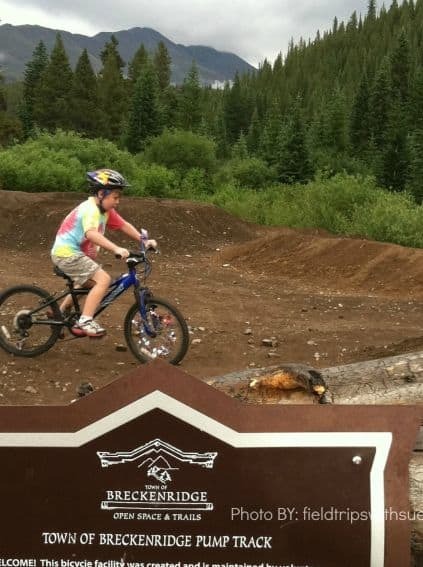 No wonder USA Today named Breckenridge as one of the top 10 places to take kids on a bike. Here are five ways to enjoy Breckenridge on two wheels. The Blue River trail is a paved bike path that runs from downtown Breckenridge, past the Breckenridge Rec Center paralleling Hwy 9 to Frisco. It’s perfect for kids who aren’t experienced riders. However, beware a couple of small, but steep hills. I winced more than once and said a little prayer my youngest didn’t go into the river on the down slope. However, a few runs and a tweak of his brakes and he was good to go. At the Breckenridge Rec Center, the Blue River Bike Trail picks up a Mountain Bike Trail as well. This easy single-track trail runs parallel to the paved bike track and is the perfect introduction to Mountain biking for kids and adults. Although there are obstacles, including stone paths, bridges and narrow trails, it’s mostly straight with no switchbacks. Next to the Stephen C. West Ice Arena is the Town of Breckenridge pump track. The pump track is circular dirt track with various hills and curves. The object is to go all the way around without pedaling, teaching kids how to use the terrain to their advantage. 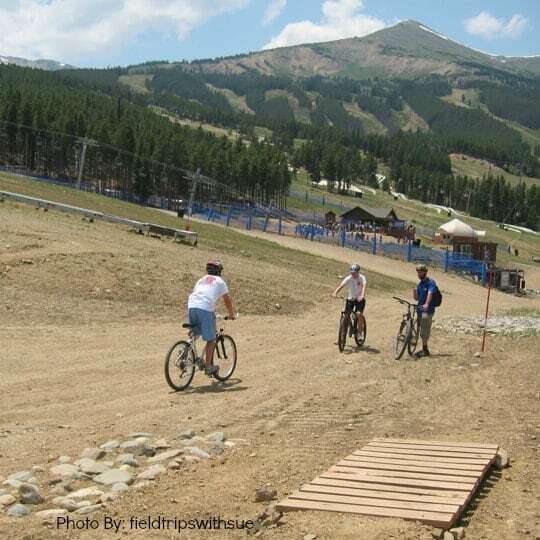 Breckenridge Ski Resort offers a mountain bike school that is a must for anyone looking to hit the trails in Breck, especially if you aren’t used to Colorado mountain bike trails. If you aren’t quite up for the Peak 8 switchbacks, you can still test your skills on the bike-training course and pump track just beyond the Gold Coaster on Peak 8. Although the mountain bike school is $85, visitors can ride the training track for free. Note this track isn’t well marked, so it helps to have done the training school first, although that is not required. 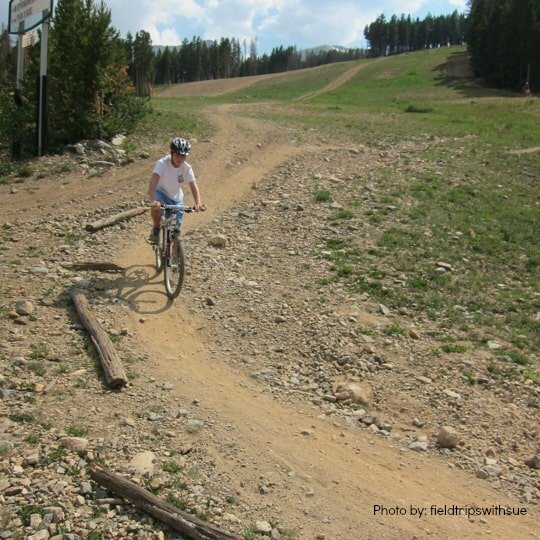 Purchase a $15 bike haul pass at the Breckenridge Gondola and take your bike up the mountain with you. There is a mountain bike trail into town, or ride the wide sidewalk along the road. Be sure your children are comfortable with their brakes before trying this. It’s downhill all the way. For more fun things to do in Colorado with kids, visit Field Trips with Sue and read the Colorado series. I love all of these ideas- especially the downhill bike ride from the top of Peak 8. But I have a question for you- did you ever have trouble with the altitude while biking? I know that we sure felt the effects of biking at a different altitude when we visited Breckenridge than we were used to in NY! Sharon, We were in Breck for a month, so we were able to get used the the altitude. We drank lots of water too. The ride down Peak 8 is so easy, just coasting and braking, that it wasn’t a problem. I took an ‘easy ride’ through town during Breck Bike Week that almost killed me, but you just have to pace yourself and listen to your body. I realized that as far as mountain biking goes, the Blue River trail was my speed. My older boys enjoyed challenging themselves on other trails.